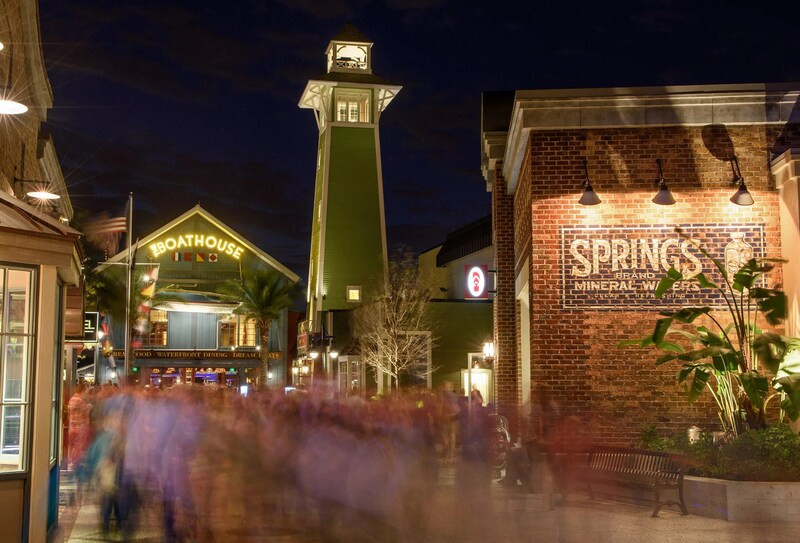 Wondering what is new at Walt Disney World in Orlando Florida? If you haven’t been to Disney in the past year, these are the new attractions in 2016 and upcoming in 2017! There is always a reason to go ‘home’ again! So here is what’s new at Disney World in 2016 and beyond! There is a wew Mickey’s Royal Friendship Faire stage show that opened in June 2016 with Disney characters Tiana of “Princess and the Frog,” Rapunzel of “Tangled,” and Anna and Elsa of “Frozen,” and a host of classic characters. 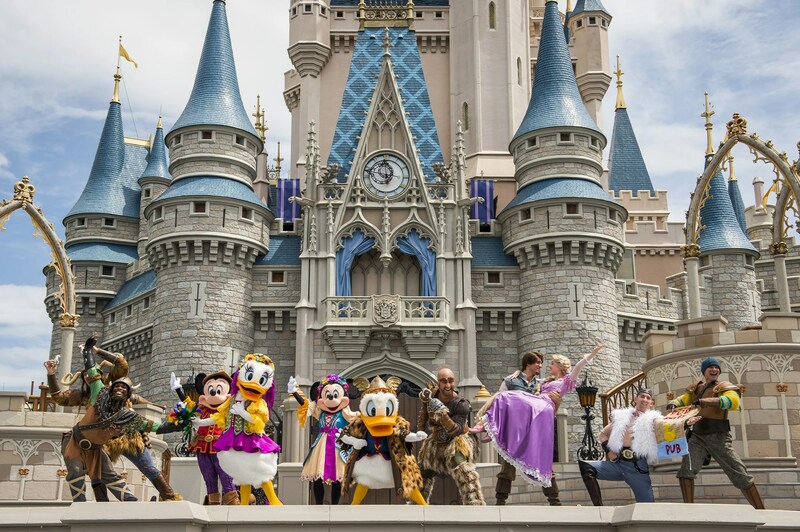 Performed on the grandest stage in the kingdom, in front of Cinderella’s Castle, the tale is that Mickey Mouse and his troupe of Merry Makers — Minnie Mouse, Donald, Daisy and Goofy invite 10 new friends from different animated worlds to join the celebration. This show combines grand dance, fireworks and stunts with an original song and special effects. 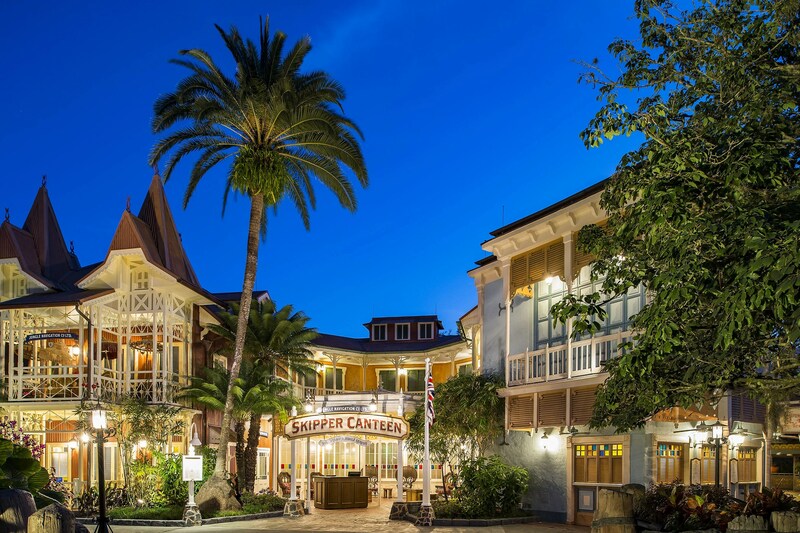 The Jungle Navigation Co. Ltd. Skipper Canteen restaurant (see my review here) opened in December 2015 in Adventureland and features a menu full of Asian, South American and African cuisine inspired by the flavors of the rivers found on the nearby Jungle Cruise attraction. The table service restaurant is staffed by the wise-cracking crew of the Jungle Cruise and is open for lunch and dinner. This family-friendly adventure in the Norway Pavilion opened in June 2016 and picks up after the events in the blockbuster hit “Frozen” and celebrates a “Summer Snow Day.” On the ride, Queen Elsa, Princess Anna, Kristoff, Olaf, trolls and Marshmallow join a boat journey through the frozen willow forest, past Troll Valley and up to the North Mountain to Elsa’s ice palace. 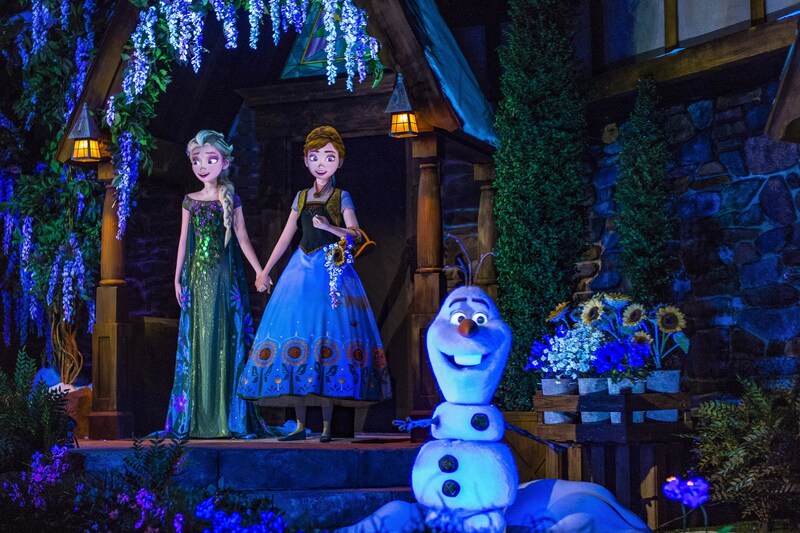 Opening in June 2016, the newest character spot for Anna and Elsa is in the cozy Royal Sommerhus in the Norway Pavilion. Inspired by a cabin in the countryside of Norway, Princess Anna and Queen Elsa have opened their summer home for visitors and want to take pictures of your. As of June 2016, experience the new Soarin’ film (and the extra theatre to accommodate the popularity of the ride). The new film features the wonders of the world. 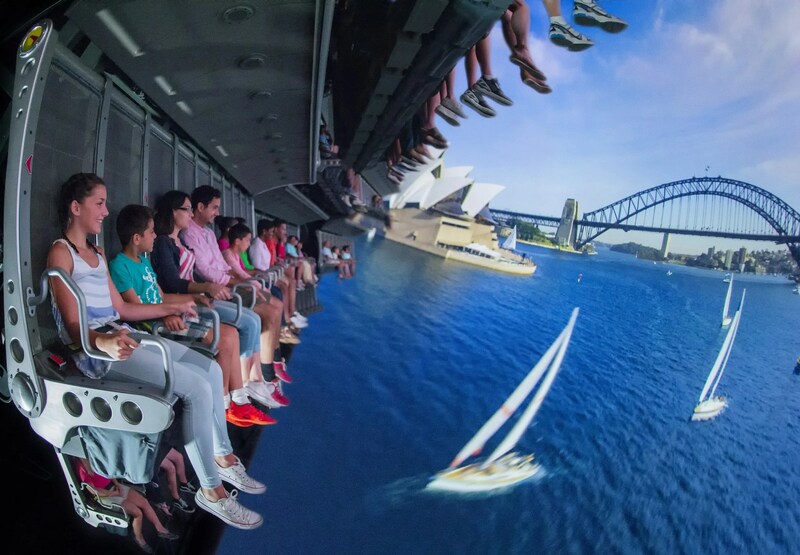 You’ll feel like you are soaring over iconic places like The Great Wall of China and the Sydney Harbor. The feature also is enhanced by scent as well as the sights! See if you can smell the coconut over the island or the grass over the plains. Dory joined the sea crew in May 2-16 in the “Turtle Talk with Crush” attraction. 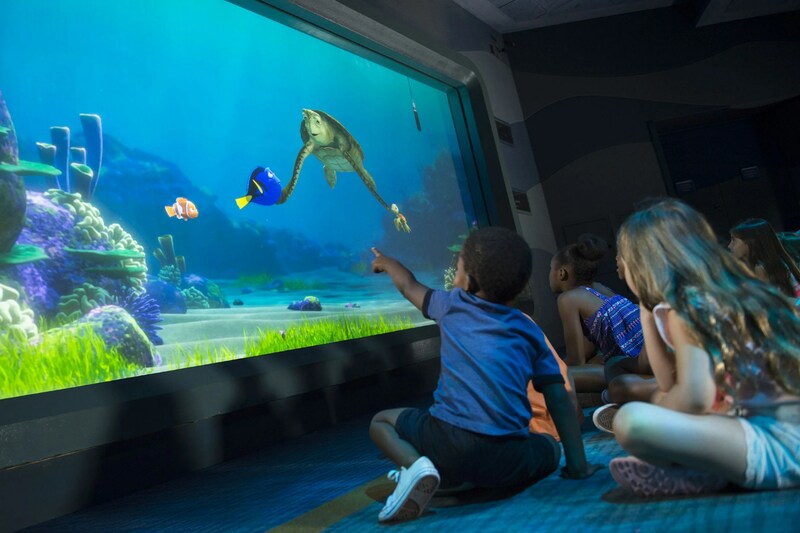 When Crush the sea turtle swims up to the “Human Tank” at Epcot, he’s now joined by Dory and some of her new friends. 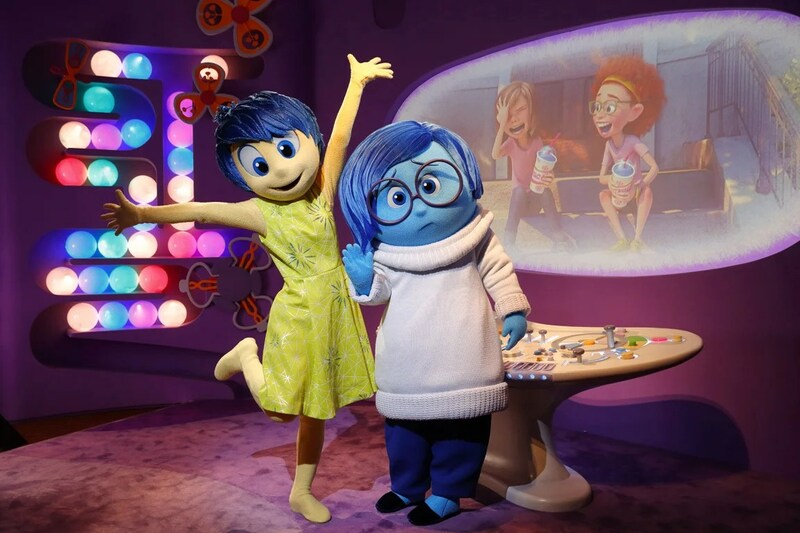 A new character meet and greet experience began in April 2016 with Joy and Sadness. This is a great themed character spot will lots of likeliness props from the movie. The year 2016 is the year of Star Wars at Disney’s Hollywood Studios with the new Star Wars Launch Bay, a central locale for fans to celebrate all things Star Wars, including character greetings with Chewbacca and Kilo Ren, new scenes from Star Wars: The Force Awakens in Star Tours – The Adventures Continue, a reimagined Jedi Training: Trials of the Temple, where younglings can train with lightsabers and fight Darth Vader, Seventh Sister Inquisitor from the popular Disney XD series Star Wars Rebels, and other characters from the Dark Side, and “Star Wars: A Galactic Spectacular,” a dazzling nighttime Star Wars-themed fireworks, laser and special effects show set to memorable Star Wars music from throughout the saga. 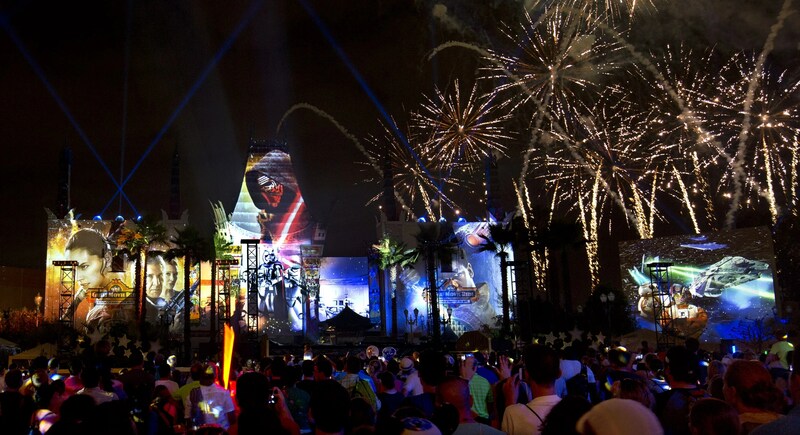 In the next couple of years, there will be a Star Wars Themed-Land arriving at Disney’s Hollywood Studios where Star Wars characters and their stories will come to life. While details are still unknown, you’ll be able to climb aboard the Millennium Falcom on a secret mission and more. 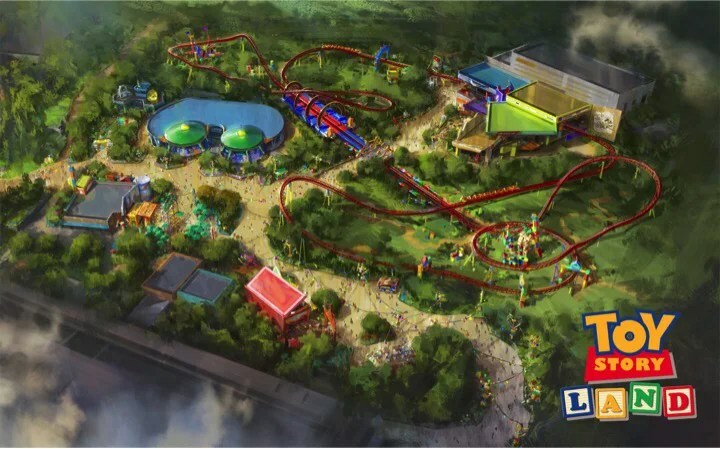 In addition to the Star Wars Themed-Land, there will also be Toy Story Land. It will be a new 11-acre land in Hollywood Studios that will transport guests into the adventurous outdoors of Andy’s backyard. There will be a family-friendly roller coaster on the back of Slinky Dog and an aliens saucer attraction. Toy Story Mania! will add a third track to the existing popular attraction too. For Disney fans wondering where these lands are going, they are taking over the Backlot attraction and some additional space from the former production studios that are no longer onsite. 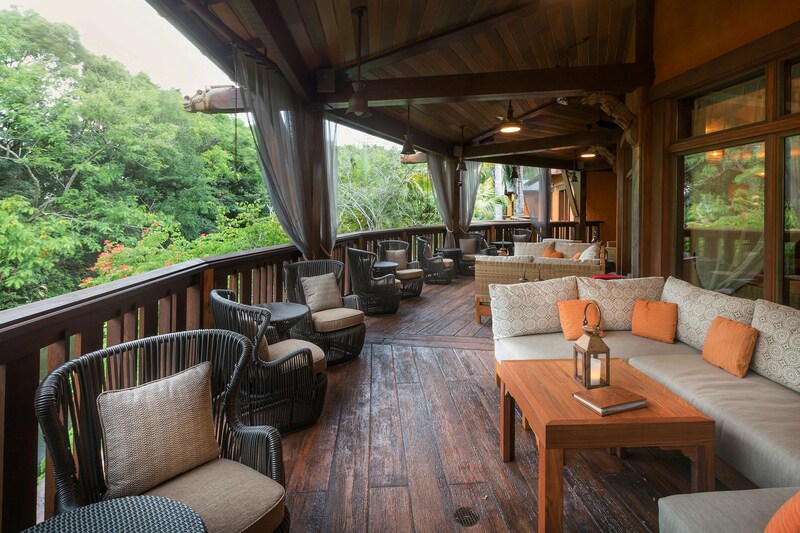 At the beginning of Summer 2016, hungry adventurers can have lunch or dinner at the new Tiffins restaurant at Animal Kingdom, The restaurant’s features travel-themed dining rooms with dishes featuring African, Asian and South American flavors. Disney’s Animal Kingdom is no longer a day-only park. 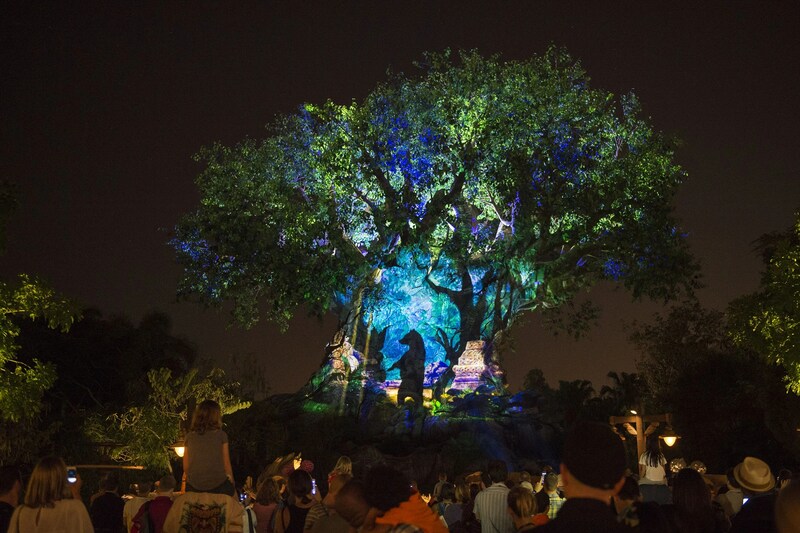 Leading up to summer 2016, the park’s iconic Tree of Life awakens each night amid a lively celebration of Discovery Island music and dance. Through stunning visuals, animal spirits appear and enchanted fireflies reveal stories of wonder as the tree morphs to showcase the magic of nature. At the popular Kilimanjaro Safaris attraction, you can now travel through the African savanna at night. Lastly, there is a new nighttime spectacular called The Jungle Book: Alive with Magic. The Discovery River in the Asia section of the park becomes the stage for music and pageantry with an Indian influence. Lastly, there is the “Rivers of Light” that combines live performances, floating lanterns, water screens and swirling animal imagery. Starting in 2017, keep an eye out for Pandora — The World of AVATAR. 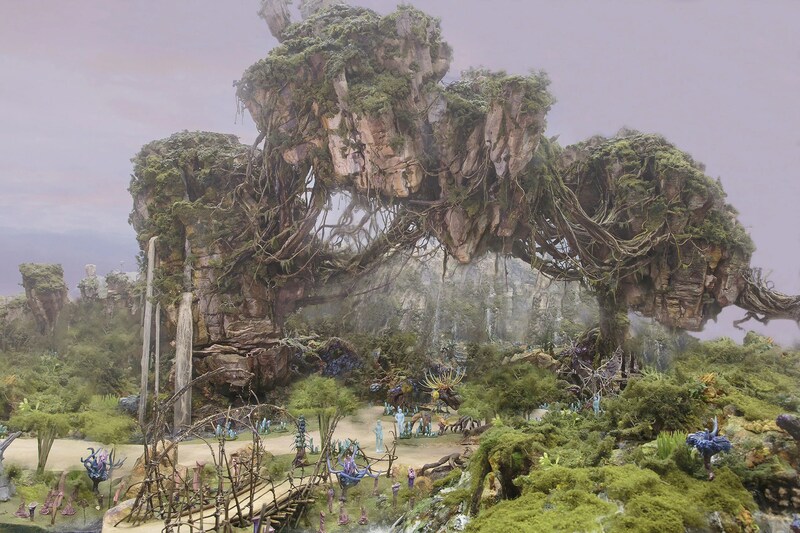 In collaboration with filmmaker James Cameron and Lightstorm Entertainment, Disney is bringing to life the mythical world of Pandora, inspired by Cameron’s AVATAR, at Disney’s Animal Kingdom theme park. There will be an awe-inspiring land of floating mountains, bioluminescent rainforests and soaring Banshees for an unforgettable experience. In addition to the World of AVATAR, there will ben an attraction called , AVATAR Flight of Passage that will open in 2017. This attraction will allow guests to soar on a Banshee over a vast alien world with a birds-eye view of the beauty and grandeur of the world of Pandora. The Edison, a lavish “Industrial Gothic”-style restaurant and bar with classic American food, artisanal craft cocktails and live entertainment; Blaze Fast-Fire’d Pizza; Frontera Cocina, a Mexican restaurant concept; STK, a modern steakhouse and a DJ playing eclectic music nightly; the BOATHOUSE, a waterfront dining experience; Jock Lindsey’s Hangar Bar, an aviation-themed lounge; Morimoto Asia, a one-of-a-kind dining experience from Chef Masaharu Morimoto. I think it may be time to book another Walt Disney World trip!